ED Forums » English » DCS World Topics » Input and Output » Saitek » Help! For example, how do I switch A-A, A-G etc... and how do I move the A-A cursors in the MFD to slew to a radar object and lock it up? Been a while and I feel a complete newbie. Is there a profile for the X-52 system which will have all those functions assigned? There are plenty of profiles floating around out there, but after hundreds of hours of flight time on the X52 I developed my own keybinds that served me quite well until I upgraded to the TMWH. Not knowing what platform you want profiles for (please consider adding more info to your thread title when asking for help), I would say map just what you need to take off (pitch/roll/rudder/throttle etc) and then fly around in various situations. Flying the Hawg? Think to yourself "I want to press TMS left long" and see which hat or switch makes the most sense. Want to uncage your seeker head? Guess what, you'll prob need that keybind for lots of platforms so maybe keep that in mind. Don't forget that you can assign X52 switches as modifiers. I basically doubled the number of keybinds on my stick by making the pinky paddle (joybutton 6 I believe) a modifier. But if you don't care about that level of personalization, just go to the DCS website, click on user files, and you should be able to find plenty of X52 profiles. 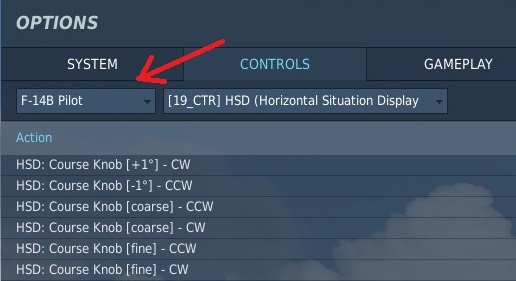 On DCS each flyable aircraft is unique (well, maybe except the Flamming Cliff's aircrafts, as they are very similar with each other from the standpoint of system's modelling) and that means that every aircraft has its own controls sheet, that you select from a list. On this sample, I've selected the F-14 Pilot's control sheet ... you should choose the sheet of your aircraft. Once the proper aircraft is selected, you can then explore all the commands that it has .. they are unique to each aircraft, tough some of them do repeat, like the View key commands, etc. Addendum: DCS really did us a solid by allowing us to edit keybinds mid mission so take full advantage of that. You can sort and filter keybind categories, so I would say as a starter, everything under the HOTAS category should be at your fingertips. Is there a manual around for the Hornet? Watch youtube vids to learn everything the quickest. There are many to choose from. Couple of hints. Stuff I wish I'd a known. 3. Save a 4-way switch for comms. When you first start flying solo, all you really need is to map comm menu but when you start using realistic coms, or if you get into multiplayer, you'll be using at least two radios and sometimes more. 4. When you're mapping a modifier key, it can either be mapped as a "switch" or a "button." Switch is like a toggle, you have to press it once to act as a modifier and press it again to turn it off. "Button" means it's only active while you are pressing it. The latter will probably work best with your hardware.